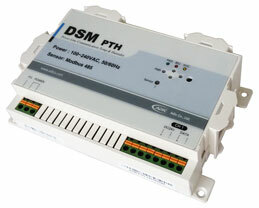 DSM PTH is a device to deliver through power line communication the temperature and humidity measured by ATHS sensor that is connected through 485 MODBUS. It connects to one ATHS. DSM PTH measures temperature and humidity for weather station.